Hotter… colder… cold… hotter… hot! Ouch! Thankfully this stage was momentary, but I admit it was a little tough on my organised self. This room is the centre of our house in a literal sense, as well as a living sense. We walk through the lounge to go between the kitchen/dining area, and the bedroom/bathroom area. There is no avoiding it – even when it looks like it should be a no-go zone. It gave us much, in the way of ambience and rustic style and a whole lot of love. But efficiency was lacking greatly. Sitting in the armchair right next to it was never close enough… there were many times when it probably looked like I was perched half on top of it in a bid to get some warm air! And I’ll be honest, it didn’t always look this glamorous – mostly it was all about poking it with a half burnt stick every few minutes to keep a little flame flickering. No way would it still be going after I popped out to pick up another bottle of cream, or drop kids at kindy. And with rumours of law changes around allowing open fires… we knew we finally needed to do something about getting a more efficient source of heat. Of course we looked into a heat pump. If you don’t have one, you’re well and truly in the minority, and absolutely missing out on being able to say gushing things about how “convenient” they are, and “so cheap!” and “oh I could never do without one”. So there must be something in them. I lost track of how many quotes came in (they somehow all seemed to quote almost exactly the same model, and at exactly the same price?!) before we almost, almost said yes, we’ll do this. We’ll do it for the resale value, and the convenience (which are one and the same are they not?!). 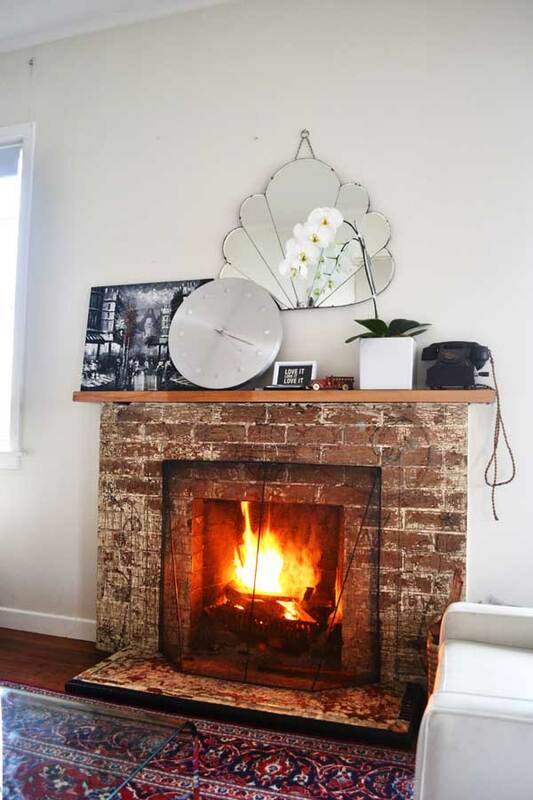 But… what I really, so desperately wanted was not just for our living area to be toasty warm, but our WHOLE HOUSE! Would that really be too much to ask?! Sadly though, no amount of pleading with these heat pump guys got them anywhere near saying yes, ok, we can place it here… or here… and it’ll be pretty effective in heating your whole house. They’re a one room only option. 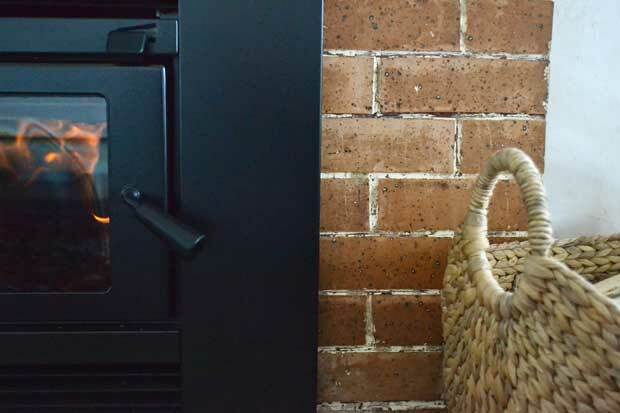 Of course, there was another option to the tune of around $8000 – a fully ducted system delivering quality heat to every room we wanted at the flick of a switch. Ideal – except for the price. 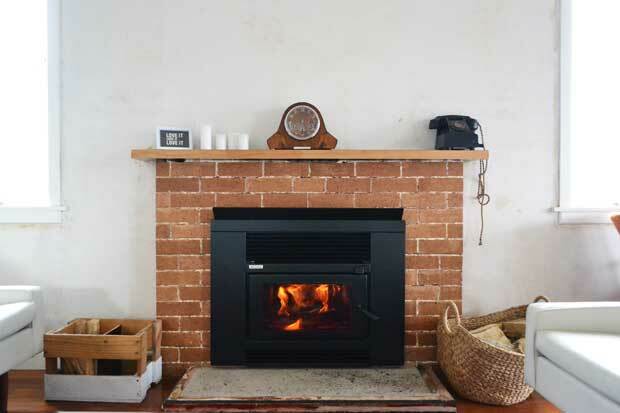 And the other thing… we are a little attached to the romantic notion of a wood burner. And we knew if we had a heat pump as well, the fire would just never get lit. We’d tell ourselves it would, but of course it would just be… too hard… and completely pointless. 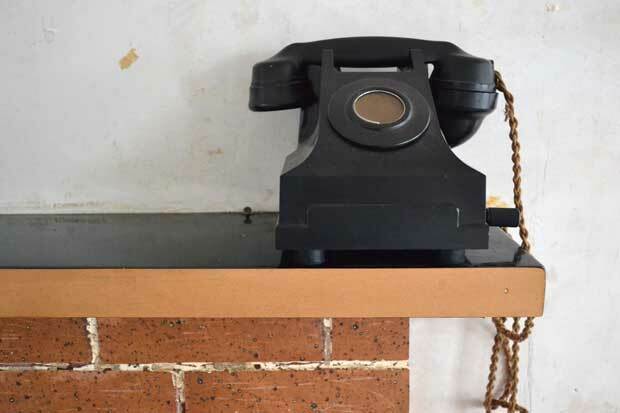 Plus I’m suspicious of that “currently on hold” ban on open fireplaces sneaking it’s way into law without so much as a “hey I’m back!”, which would leave us with a useless hole in the wall. 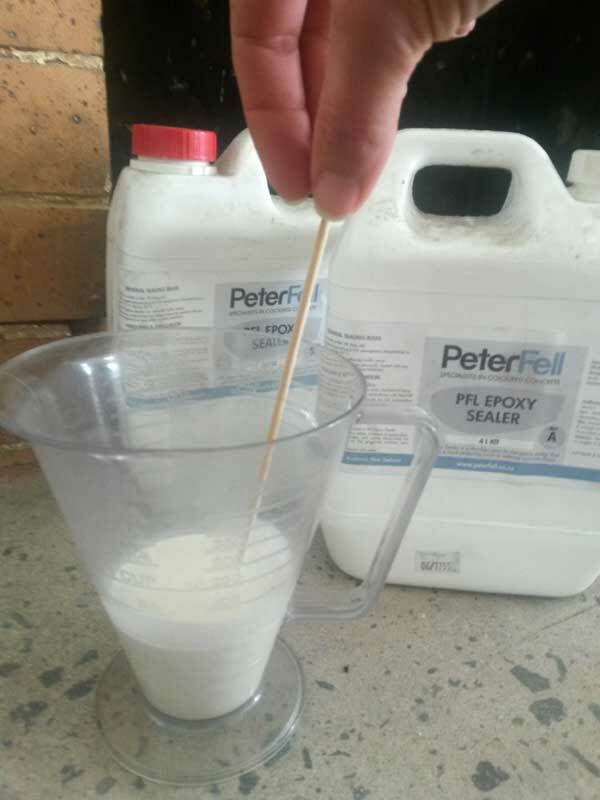 So after all this indecision I was finally convinced by coming across a forum that discussed heat transfer kits and how they really are effective when used in conjunction with an efficient wood burner. 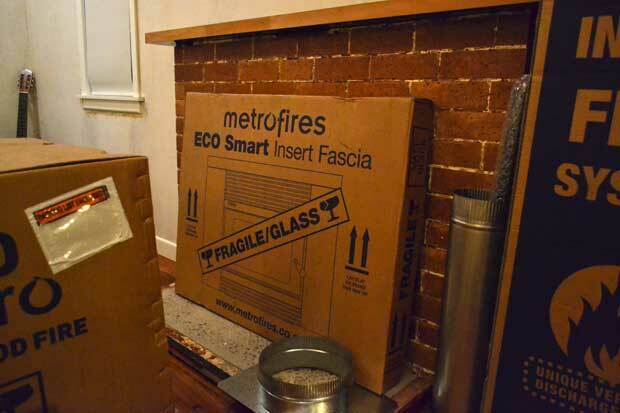 Annnnnnd… with an April/May special on a 3 room heat transfer kit bought with any new Metro fireplace (which turned out to be the only brand of insert that would fit our current opening) it was looking like the better option all round. 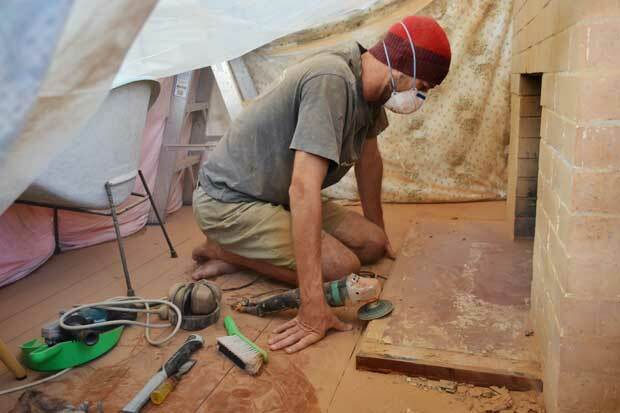 Sitting in the middle pricewise, but achieving my goal of a warm and dry house (not just a room! ), and the bonus of no ongoing costs (we’ve never had a problem getting free firewood), it was a done deal. Decision made! 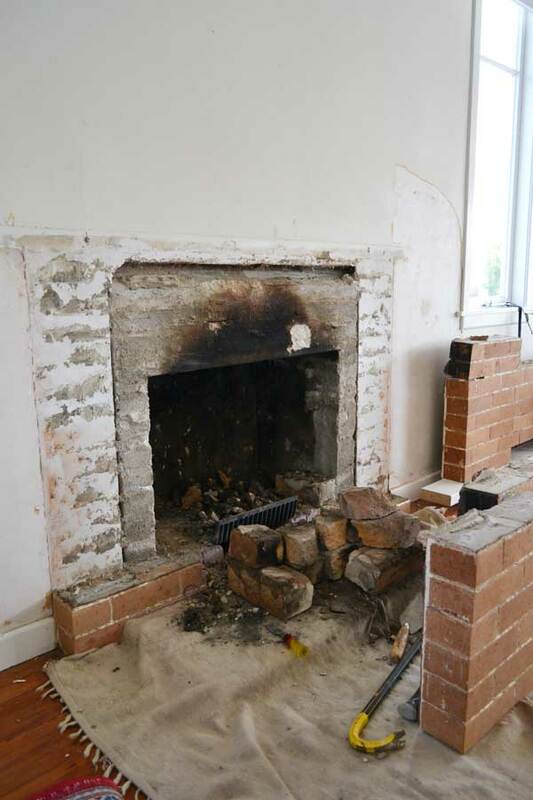 So, it was onto scrubbing up that fireplace to get ready for it’s fancy new insert! We have always intended to do something about the marker scrawls all over the brick (drawn as a guide for the mosaic pattern), as well as the mantel and hearth. None of the three were in great condition, but we’d got used to them… and knew it was going to be a messy job, so avoided it accordingly! 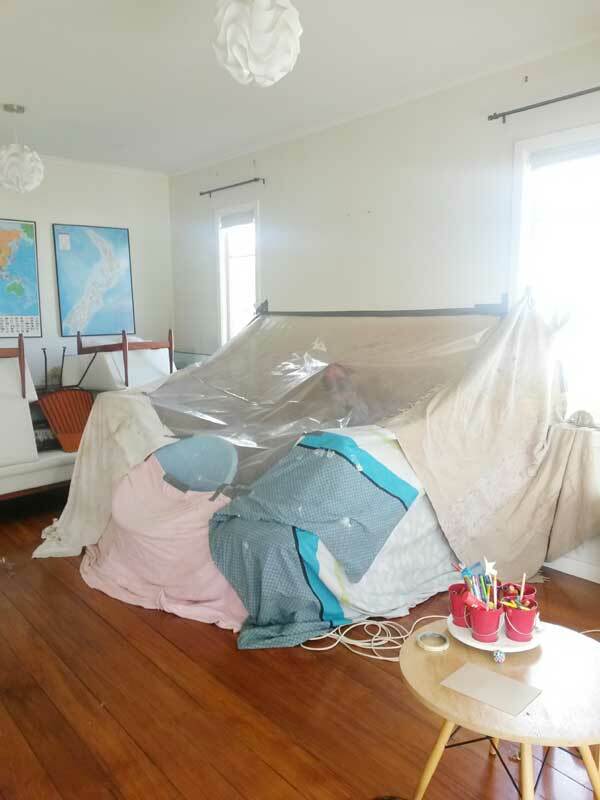 But the time had come… to set up an adult size play fort a sealed dust enclosure, and get to work. Despite our great precautions, this red brick dust has a mind of it’s own and did manage to find it’s way out, but a little deep breathing, a stress relieving cup of tea, and a whole lot of vacuuming, wiping, and mopping, and we were back to relative normal. And Andre had a good long shower! And once the dust settled and the nerves calmed, we could see the plan to remove the marking all over the brick was rather successful! 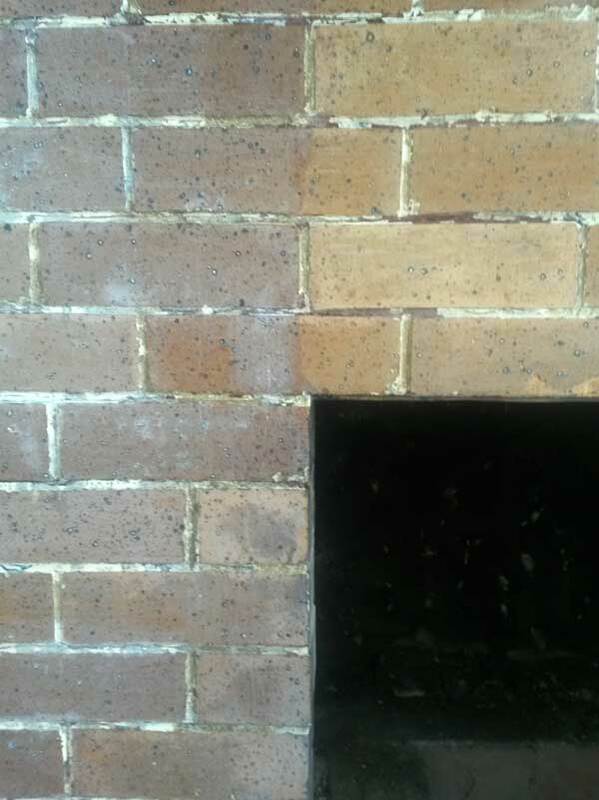 But it seemed the brick was a little less attached to the wall than we assumed, because of some chunks of mortar having broken off and weasled their way in between the wall and the surround over time. 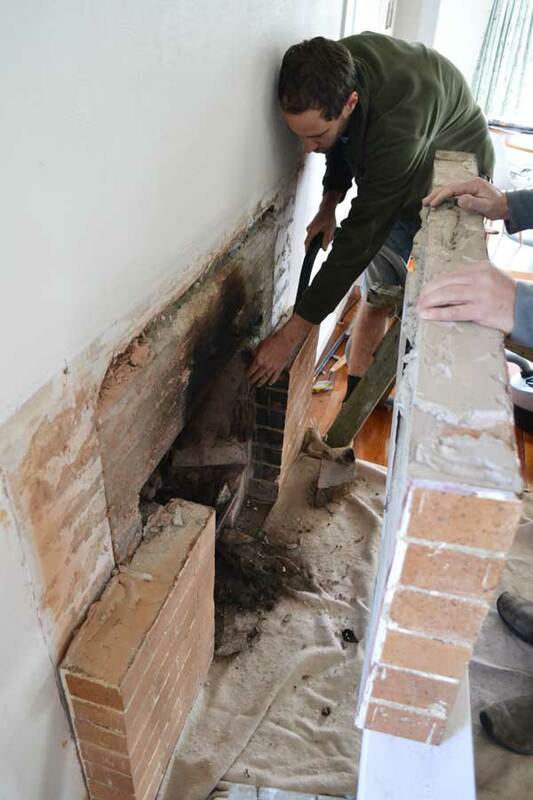 However, what was going to be a straightforward job of chipping that away and refixing the top half of the surround to the wall ended with dismantling the entire surround and a good portion of the firebricks inside. Meaning… no fire at all until the new one was installed. I did have a little moment of sadness that we would never sit in front of our open fire again, but was glad I had “wasted” the entire previous evening reading a trashy novel right in front of the crackling flames! Life Lesson #1: do nothing more often – you won’t regret it! It all got put back together safely a few days later, and we could stand back and see how that brick was looking. My first reaction was “oh! it’s so orange!”. And actually I’m still thinking it’s rather orange… the grinding took off not just the drawn on pattern, but a layer of red stain/paint/mortar/something-or-other. And while I’m not a big fan of red (don’t ask me how it got to be the somewhat overriding colour in our lounge?!) I’m even less so of orange. Especially when it suddenly clashes with our rug. …And I made an executive decision to leave thinking about it until the new fire was put in, then live with it for a while and make a decision over time. 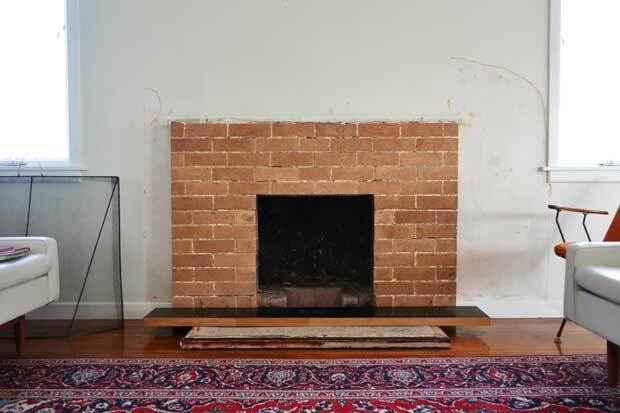 Because what we do with the brick, is dependent on what we do with both the hearth, and the mantelpiece. The mantelpiece had its front edge planed off a while back on a whim. A whim along the lines of “I wonder what kind of timber is under here?” We may replace this entirely with something non-combustible, so we can remove the heat deflector from off the top of the fire. 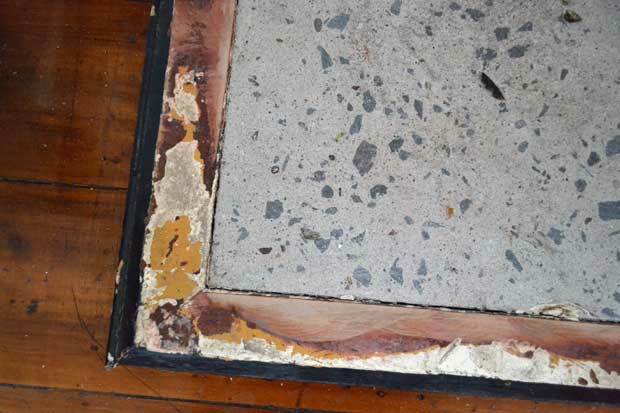 And the hearth is a little disastrous looking right now too – rough ground concrete which doesn’t play nicely with the brick, surrounded by some battered timber edging. Not sure what we’ll do about this one. It’ll take some sitting in front of the fire contemplating no doubt! Anyway, we had the insert installation booked for one day last week (which meant about two weeks between enjoying our last open fire, and getting the new one in), and I was more than a little excited as the day approached. I was that annoying person that rings to check in the morning – “What time did you say you were coming?” Afternoon it was. Afternoon came, and was passing… and by 3.30pm I was thinking this doesn’t bode well for lighting our fire tonight. So one more phone call which eventually came back with the message that the installer had no record of our job on his schedule. Oh I could have howled! And just to rub it in, everything had been delivered the day prior, and we had to pretend like it was ok that we were making do with a picture on a box. I knew, with the recent weather we’ve been having that that could have meant another two weeks delay before we could be scheduled in again. But the installer must have felt sorry for us and offered to come over and get it done in the middle of the only long weekend we get between April and October! Even though it was raining and slippery up there on the roof. Thanks Colin, thanks ever so much! After a tedious afternoon of conditioning the fire by lighting two sheets of paper on the hour, every hour, for eight hours according to the instructions of the user manual (and the first time I’ve seen Andre read one, let alone pay any heed to it…?!) we finally got to light it for real the following day. A fire for the Queen’s birthday – how about that?! And the next day I woke to a fire going (thanks Andre! ), and came home to a fire going, and came home to a fire going again… oh this is the life! And now, I’m off to sit with a trashy novel in front of the fire. Life Lesson #2: Pay attention to Life Lesson #1 – you won’t regret it! 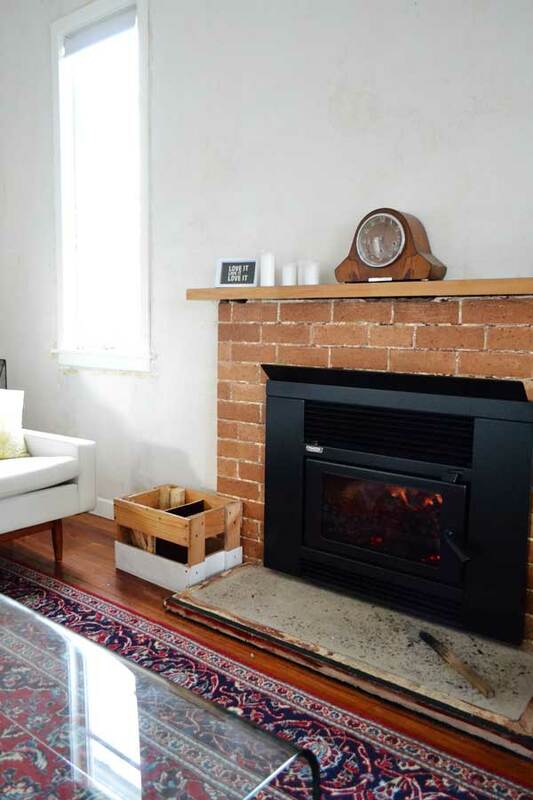 This entry was posted in Living & Lounge and tagged brick fireplace, decor, diy, efficient wood burner, fireplace, firewood, interior, living room, lounge, makeover, metro, metro fires, new zealand, open fire, renovation, retro, scandinavian, style, wood burner on June 3, 2015 by Jolene. 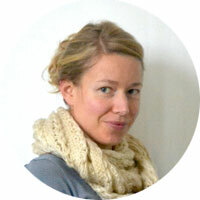 I'm a mama to two, a wife, a graphic designer and a home renovator. Duck Egg Blue is my creative outlet for all things design and DIY. You'll find awesome home decor, mid century gems, design geekery and our very own renovation and DIY adventures. I hope you also find enjoyment, inspiration or at least a DIY warning or two!